Darien's Michael Johnston crosses the finsh during FCIAC boys cross country at Wavenly Park in New Canaan, Conn. on Thursday October 21, 2010. Following a very successful running career at Darien High, Michael Johnston took on the unimaginable: a marathon. Johnston, who graduated DHS last week, was a two-time All-FCIAC First Team selection in cross country as well as an All-State selection this past cross country season. 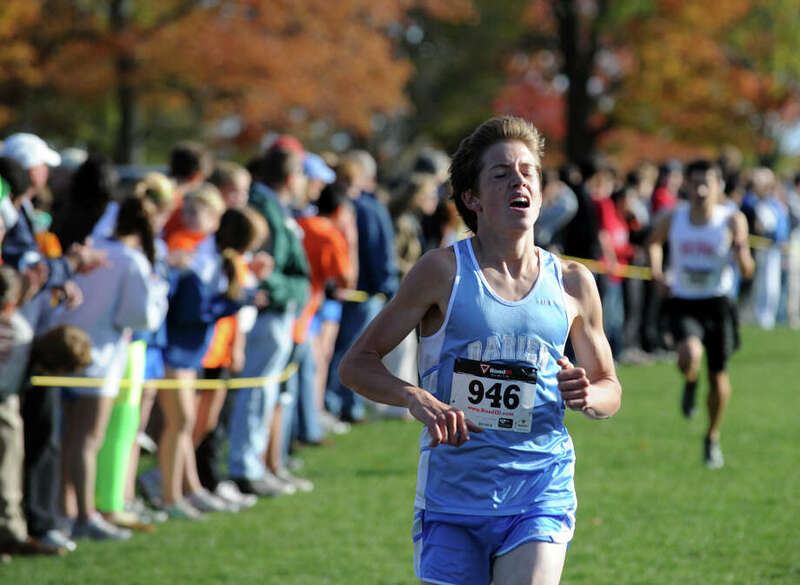 Johnston was also part of two State Championship cross country teams his sophomore and senior seasons. Two week ago, Johnston ended his running career at DHS with a 10th place finish in the State Open in the 3,200 in 9:40.38, a personal best. Traveling up to Lake Placid, N.Y., Johnston took first overall in the Lake Placid Marathon in his first marathon ever. Johnston clocked in at 2:35:48, for the 26.2 mile course, just under 6:00 minutes per mile. "Mindboggling. That is the only word I can use to describe this accomplishment. I thought Michael might be under 3 hours. He blew that away," Darien track coach Tyson Kaczmarek said. "No way did I ever think he could run the time he did. He was only running about 50 miles per week and had tapered to 35 for the end of the track season. He did no marathon training. He was training for a two mile race." What is even more impressive is Johnston's time is only 16 minutes away from the Olympic trial standard of 2:19. "The fact it is that close to the Olympic mark is amazing. That puts it in complete perspective. I told Michael `you have 10 more years of good running in you at least. Maybe even 15. No regrets,'" Kaczmarek said. "It's funny too because Michael just wanted to do this to get the school record. The ironic part is we don't even know if there is one."